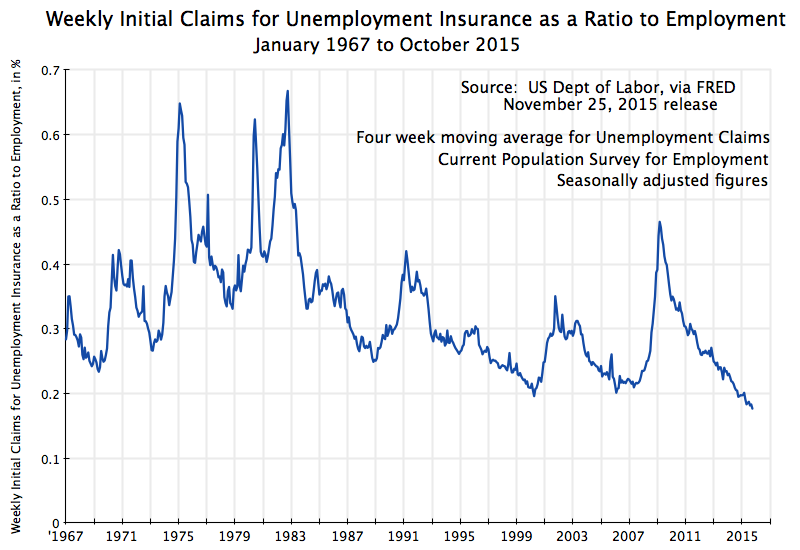 An important issue in the current presidential campaign, although somewhat technical, is whether one should expect that employment could jump to substantially higher levels than where it is now, if only economic policy were better. The argument is that while the unemployment rate as officially measured (4.9% currently) might appear to be relatively low and within the range normally considered “full employment”, this masks that many people (it is asserted) have given up looking for jobs and make up a large reservoir of “hidden unemployed”. If only the economy were functioning better, it is said, more jobs would be created and taken up by these hidden unemployed, the economy would then be producing more, and everyone would be better off. This is important for the Republicans, not only as part of their criticism of Obama, but also as a basis for their tax plans. As discussed in the previous post on this blog, the Republican tax plans would all cut tax rates sharply, leading to such revenue losses that deficits would rise dramatically even if non-defense discretionary budget expenditures were cut all the way to zero. The Republican candidates have asserted that deficits would not rise (even with sharply higher spending for defense, which they also want), because the tax cuts would spur such a large increase in growth of GDP that the tax revenues from the higher output would offset the reductions from lower tax rates. 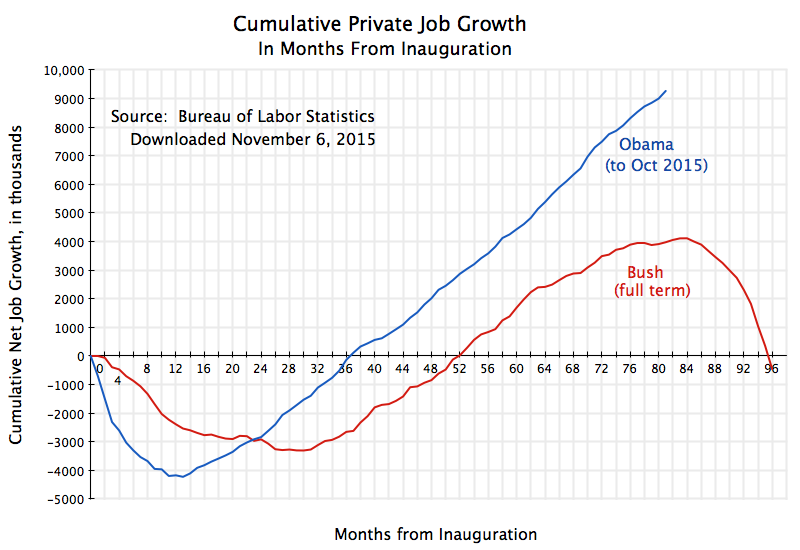 Aside from the fact that there is no evidence to support the theory that such tax cuts would spur growth by any amount, much less the jump they are postulating (see the earlier blog post for a discussion), any rise in GDP of such magnitude would also depend on there being unemployed labor to take on such jobs. With the economy now at close to full employment (with the unemployment rate of 4.9%), this could only be achieved if a large pool of hidden unemployed exists to enter (or re-enter) the labor force. Given the huge magnitudes involved, few economists see these Republican tax plans as serious. One cannot have such massive tax cuts and expect deficits not to rise. And Democrats have long criticized such Republican plans for being unrealistic (there were similar, although not as extreme, Republican tax plans in the 2012 campaign, and Paul Ryan’s budget plans also relied on completely unrealistic assumptions). Unfortunately, the Bernie Sanders campaign this year on the Democratic side has similarly set out proposals that are economically unrealistic. A detailed assessment of the Bernie Sanders economic program by Professor Gerald Friedman of the University of Massachusetts at Amherst concluded that the Sanders program would raise GDP growth rates by more than even the Republicans are claiming. But even left-wing commentators have criticized it heavily. Kevin Drum at Mother Jones, for example, said the Sanders campaign had “crossed into neverland”. A more detailed and technical evaluation from Professors Christina Romer and David Romer of UC Berkeley (with Christina Romer also the first Chair of the Council of Economic Advisers in the Obama Administration), concluded Friedman’s work was “highly deficient”, as they more politely put it. And an open letter issued by four former Chairs of the Council of Economic Advisers under Obama and Bill Clinton (including Christina Romer) said “the economic facts do not support these fantastical claims”. To be fair, the relationship of the Friedman work to the Sanders campaign is not fully clear. At least one news report said the analysis was prepared at the request of Sanders, while others said not. But upon its release, the Sanders campaign did explicitly say it was “outstanding work” which should receive more attention. And when the work began to be criticized by economists such as the former chairs of the CEA, the response of the Sanders campaign was that their criticism should be dismissed, as they were of “the establishment of the establishment”. Rather than engage on the real issues raised, the Sanders campaign simply dismissed the criticisms. This does not help. Both the Republican plans and the Sanders program depend on the assumption that so many workers would enter or re-enter the labor force that GDP could take a quantum leap up from what current projections consider to be possible. (Both depend on other assumptions as well, such as unrealistically high assumptions on what would happen to productivity growth. But it is not the purpose of this blog post to go into all such issues. Rather, it is to address the single issue of labor force participation.) Their plans depend on a higher share of the population participating in the labor force than currently choose to do so, leading to an employment to population ratio that would thus rise sharply. We will look in this post at whether this is possible. An earlier post on this blog examined similar issues. This post will come at it from a slightly different direction, and will update the figures to reflect the most recent numbers. The key chart will be the one shown at the top of this post. But to get to it, we will first go through a series of charts that set the story. The data all come from the Bureau of Labor Statistics (BLS), either directly, or via the data set maintained by the Federal Reserve Bank of St. Louis (FRED). Employment as a share of the population fell rapidly and sharply with the onset of the economic downturn in 2008, in the last year of the Bush Administration, and reached a low point in late 2009. From about 63% in 2007 to around 58 1/2% in late 2009, it fell by over 7%. It then remained at such low levels until 2013, rising only slowly, and since then has risen somewhat faster. But at the current reading of 59.8%, it remains well below the 63% levels of 2007. And it remains even more below the peak it reached in the history of the series of 64.7% in April 2000. If this does, in fact, reflect a pool of hidden unemployed, then GDP could be significantly higher than it is now. Assuming for simplicity that GDP would rise in proportion to the increase in workers employed, annual GDP would be close to a trillion dollars higher if the employment to population ratio rose from the current 59.8% to the 63% that prevailed in 2007. And annual GDP would be close to $1.5 trillion higher if the ratio could revert to where it was in April 2000. With a share of about 25% of this accruing in taxes, this would be a significant pot of money, which could be used for many things. But is this realistic? The short answer is no. The population has moved on, with important demographic as well as social changes that cannot be ignored. A problem with the employment to population measure is that people will not be employed not just due to unemployment (are looking but cannot find a job), but also because they might not want to be working at the moment. If older, they might be retired, and happily so. If younger (the figures are for all adults in the civilian population, defined as age 16 or older), they might be students in high school or college. And not all those in middle age will want to be working: Until recent decades, a large share of adult women did not participate in the formal labor force. Women’s participation in the formal labor force has, however, changed significantly over time, and is one of the key factors underlying the rise seen in the overall labor force participation rate over time. Such factors should not be ignored, but are being ignored when one looks solely at the employment to population ratio. 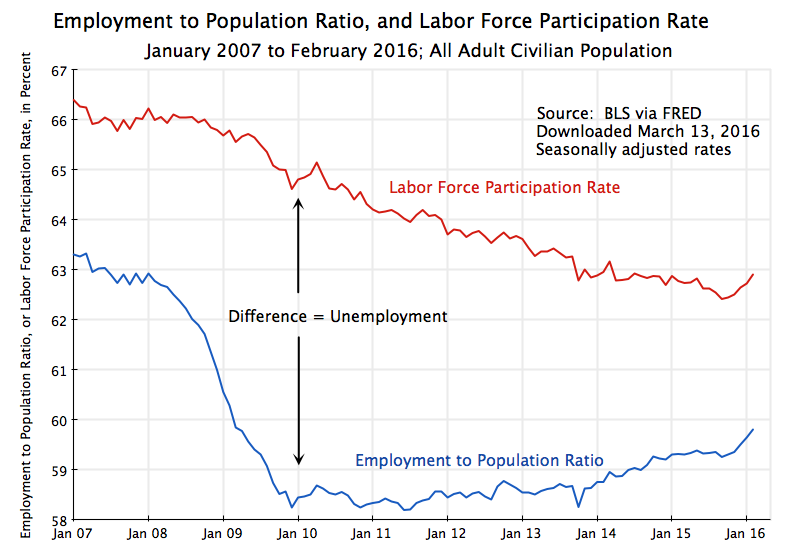 Note the unemployment rate as traditionally referred to (currently 4.9%) is not the simple difference, in percentage points, between the labor force participation rate (62.9% in February 2016) and the employment to population ratio (59.8% in February 2016). The unemployment rate is traditionally defined as a ratio to the labor force, not to population, while the two measures of labor force participation rate and employment to population ratio are both defined as shares of the population. 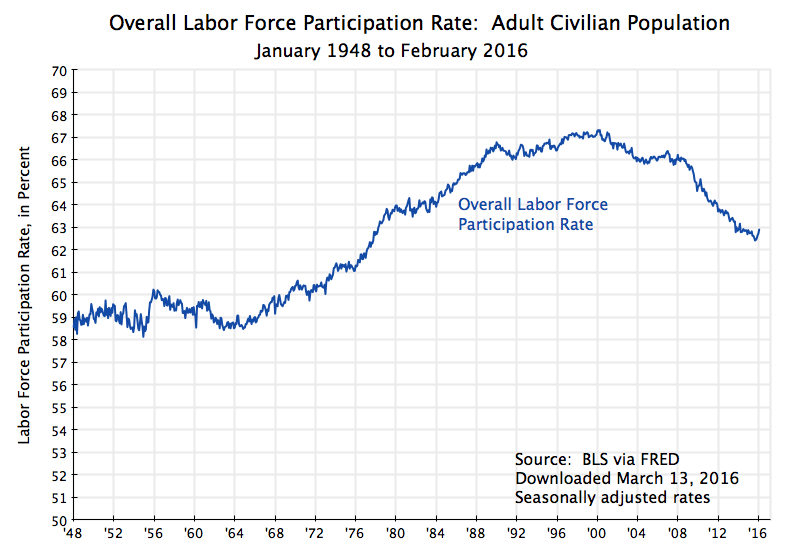 Note that if you take the difference here (62.9% – 59.8% = 3.1% points in February 2016), and divide it by the labor force participation rate (62.9%), one will get the unemployment rate of 4.9% of the labor force. But all this is just arithmetic. The key point to note for the chart above is that while the employment to population ratio fell sharply in the 2008-2009 downturn, and then recovered only slowly, the labor force participation rate has been moving fairly steadily downward throughout the period. There is month to month variation for various reasons, including that all these figures are based on surveys of households. There will therefore be statistical noise. But the downward trend over the period is clear. The question is why. Does it perhaps reflect people dropping out of the labor force due to an inability to find jobs when the labor market is slack with high unemployment (the “discouraged worker” effect)? Some commentators have indeed noted that the upward bump seen in the figures in the last few months (since last November), with the unemployment rate now low and hence jobs perhaps easier to find, might reflect this. Or is it something else? The series peaked in early 2000, at a rate of 67.3%, and has moved mostly downward since. It was already in 2007 well below where it had been in 2000, and the decline since then continues along largely the same downward path (where the flattening out between 2004 and 2007 was temporary). 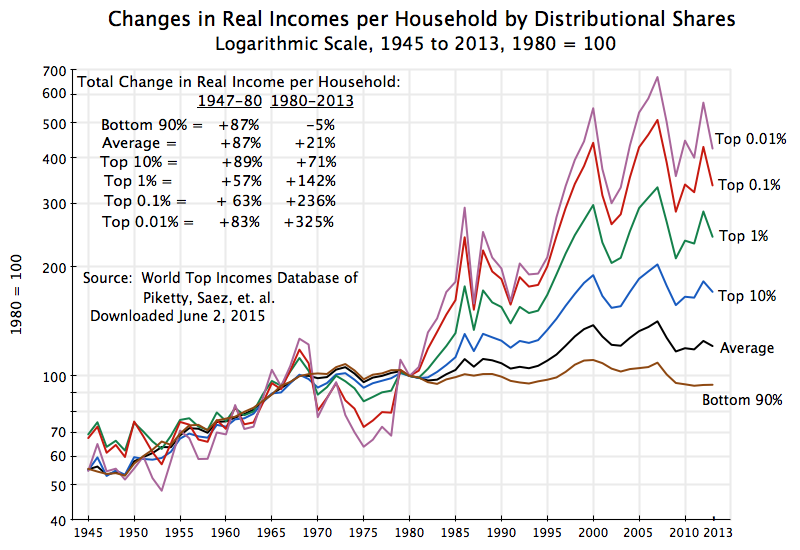 Prior to 2000, it had risen strongly since the mid-1960s. One does see some downward deviation from the trend whenever there was an economic downturn, but then that the series soon returned to trend. Thus, for example, the labor force participation rate rose rapidly during the years of Jimmy Carter’s presidency in the late 1970s, but then leveled off in the economic downturn of the early 1980s during the Reagan years. 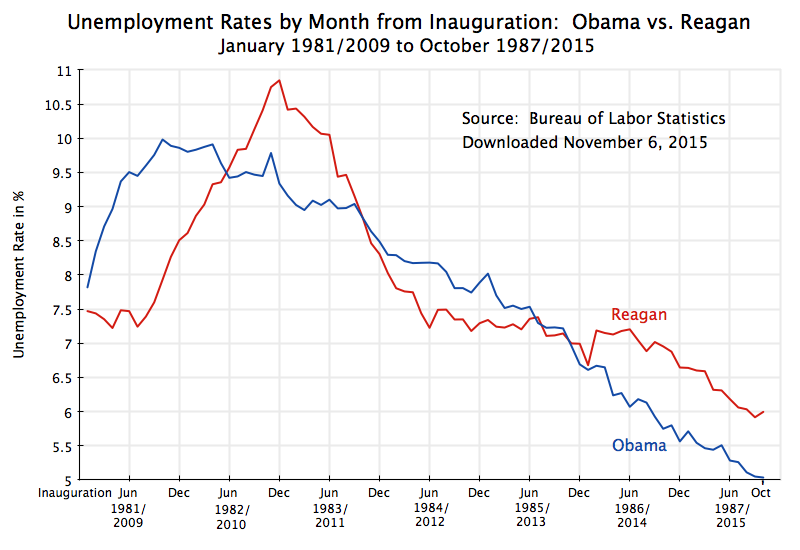 The unemployment rate peaked at 10.8% in late 1982 under Reagan (significantly more than the 10.0% it peaked at in 2009 under Obama), and one can see that the labor force participation rate leveled off in those years rather than continued the rise seen in the years before. But these are relatively mild “bumps” in the broader long-term story of a rise to 2000 and then a fall. The long term trend has therefore been a fairly consistent rise over the 35 years from the mid-1960s to 2000, and then a fairly consistent fall in the 16 years since then. The question to address next is why has it behaved this way. As people age, they seek to retire. Normal retirement age in the US has been around age 65, but there is no rigid rule that it has to be at that precisely that age. Some retire a few years earlier and some a few years later. But as one gets older, the share that will be retired (and hence not in the formal labor force) will increase. And with the demographic dynamics where an increasing share of the US population has been getting older over time (due in part to the baby boom generation, but not just that), one would expect the labor force participation rate to decline over time, and especially so in recent years as the baby boom generation has reached its retirement years. At the other end of the age distribution, an increasing share of the adult population (defined as those of age 16 or more) in school in their late teens and 20s will have a similar impact. Over this period, the share of the population (of age 16 or more) in school or college has been increasing. The other key factor to take into account is male and female differences in labor force participation. 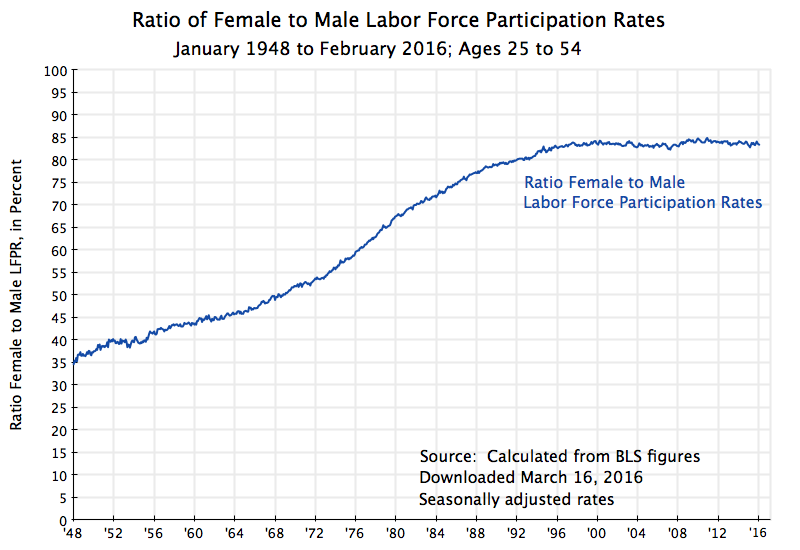 A half century ago, most women did not participate in the formal labor force, and hence were not counted in the labor force participation rate. Now they do. 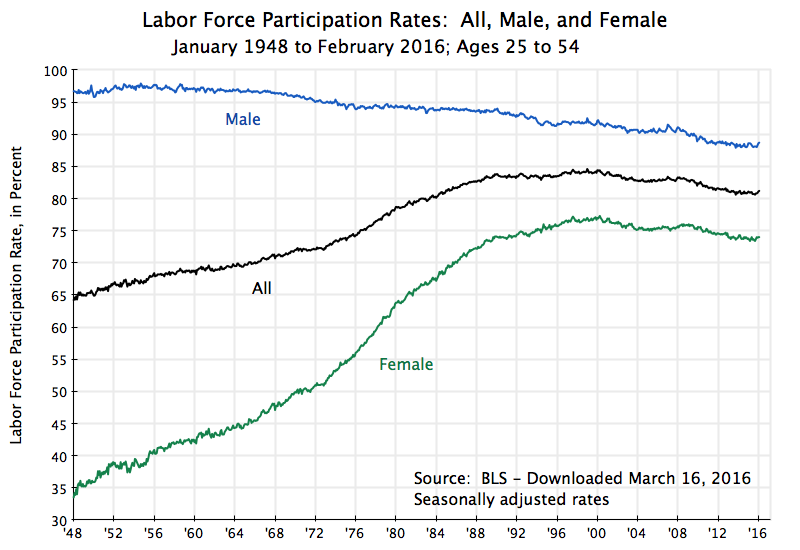 This has had a major impact on the overall (male plus female) labor force participation rate, and this change over time has to be taken into account. The impact of these factors can be seen in the key chart shown at the top of this blog. Male and female rates are shown separately, and to take into account the increasing share of the population in their retirement years or in school, the figures presented are for those in the prime working age span of 25 to 54. The trends now come out clearly. The most important trend is the sharp rise in female participation in the formal labor force, from just 34% (of those aged 25 to 54) at the start of 1948 to a peak of over 77% in early 2000. The male rate for this age group, in contrast, has followed a fairly steady but slow downward trend from 97 to 98% in the early 1950s to about 88% in recent years. As a result, the combination of the male and female rates rose (for this age group) from 65% in 1948 to a peak of 84% in 2000, and then declined slowly to 81% now. Seen in this way, the recent movement in the labor force participation rate does not appear to be unusual at all. Rather, it is simply the continuation of the trends observed over the last 68 years. The male rate fell slowly but steadily, and the female rate at first rose until 2000, and then followed a path similar to the male rate. The overall rate reflected the average between these two, and was driven mostly by the rise in the female rate before 2000, and then the similar declines in the male and female rates since then. This ratio rose steadily until 2000. But what is perhaps surprising is how steady this ratio has been since then, at around 83 to 84%. An increasing share of females entered the labor force until 2000, but since then the female behavior has matched almost exactly the male behavior. For both, the share of those in the age span of 25 to 54 in the labor force declined since 2000, but only slowly and at the same pace. The male rate continued along the same trend path it had followed since the early 1950s; the female rate first caught up to a share of the male rate, and then followed a similar and parallel downward path. Why the female and male rates moved at such a similar and parallel pace since 2000, and at a 83 to 84% proportion, would be interesting issues to examine, but is beyond the scope of this blog post. One hypothesis is that the parallel downward movements since 2000 reflect increasing enrollment in graduate level education of men and women older than age 25 (and hence included in the 25 to 54 age span). But I do not know whether good data exists for this. Another hypothesis might be that very early retirement (at age 54 or before), while perhaps small, has become more common. And the ratio of the female rate to the male rate of a steady 83 to 84% might reflect dropping out of the labor force temporarily for child rearing, which most affects women. More data would be required to test any of these hypotheses. But it appears to be clear that long-term factors are at play, whether demographic, social, or cultural. And the pattern seen since 2000 has been quite steady for 16 years now. There is no indication that one should expect it to change soon. 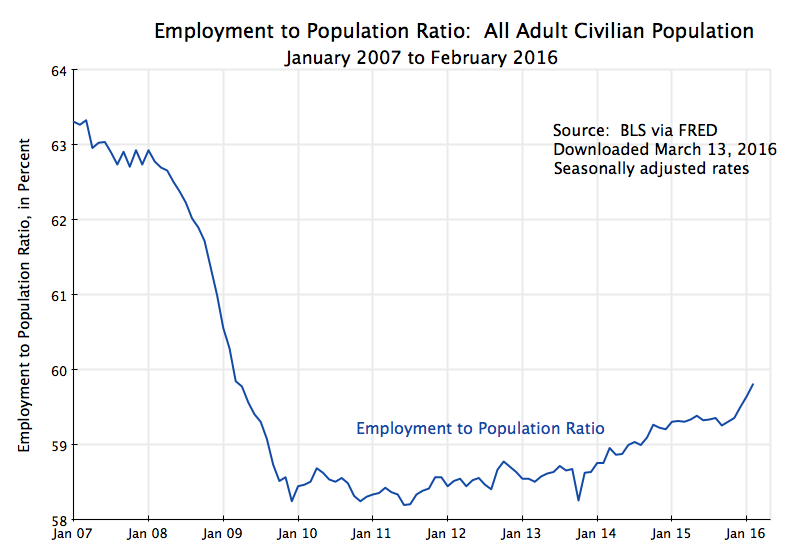 The downward movement in the employment to population ratio in 2008 and 2009 reflected the sharp rise in unemployment sparked by the economic and financial collapse of the last year of the Bush administration. 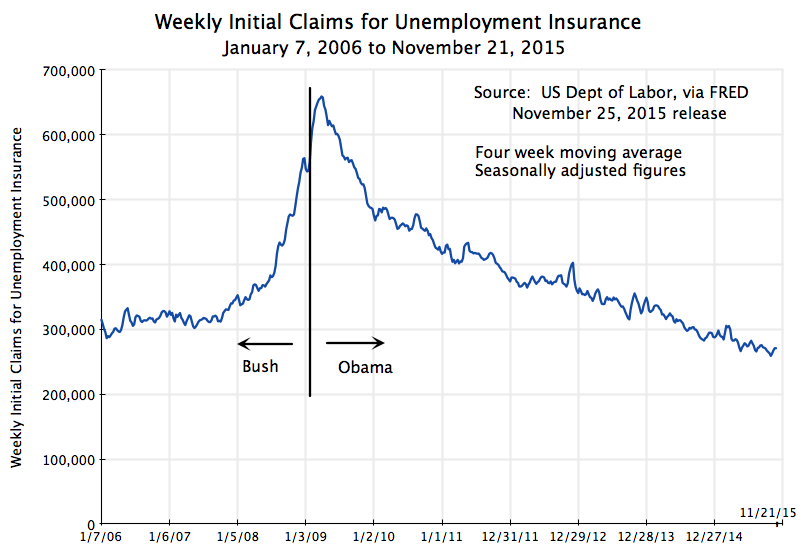 Unemployment then peaked in late 2009, as the economy began to stabilize soon after Obama took office, with Congress passing Obama’s stimulus program and the aggressive actions of the Fed. From late 2009, the employment to population ratio was at first flat and then rose slowly, as falling unemployment was offset by a steadily falling labor force participation rate. But the fall since 2007 in the labor force participation rate did not represent something new. Rather, it reflected a continuation of prior trends. Once one takes into account the increasing share of the population either in retirement or in school (by focussing on the behavior of those in the prime working ages of 25 to 54), and most importantly by taking into account female and male differences, the trends are quite steady and clear. The movement since 2007 in the recent downturn has not been something special, inconsistent with what was observed before. The implications for the economic programs of the Republican presidential candidates as well as Bernie Sanders on the Democratic side, are clear. 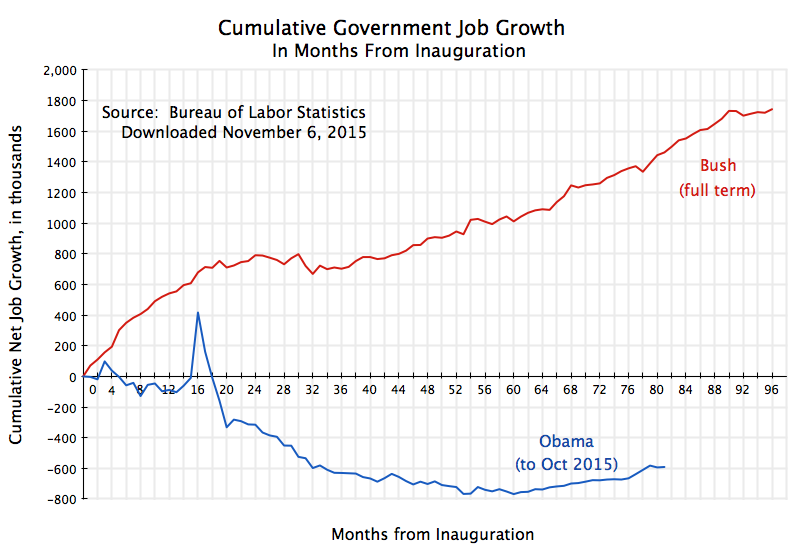 While there will be month to month fluctuation in the data, and perhaps some further increase in the labor force participation rate, one should not assume that there is a large reservoir of hidden unemployed who could be brought into gainful employment and allow there to be a large jump in GDP. Economic performance can certainly be improved. The rate of growth of GDP should be higher. But do not expect a quantum leap. One should not expect miracles. The Affordable Care Act (ACA, and also often referred to as ObamaCare) has been working well by any objective measure. There are now more than 10 million additional Americans who have health insurance who could not get affordable health care before; the share of the uninsured in the US population is now a quarter less than what it was before the individual mandate of the Affordable Care Act went into effect; and this has been achieved at premium rates for the new plans that are reasonable and well less than opponents charged they would be. Health care costs have also stabilized under Obama, both as a share of GDP and in terms of health prices relative to overall prices, in contrast to the relentless increases in both before. And while some have criticized this, it is good that there are now minimum quality and coverage standards in health insurance plans. Such standards are good in themselves. And without such standards, purported health care “plans” which offer next to nothing (due, for example, to extremely high deductibles) and which can then cost next to nothing, would lead to a death spiral for genuine health care plans that cover costs when you are sick and need treatment. Gains from the ACA are also reflected in the findings of a recently published report from The Commonwealth Fund. The Commonwealth Fund has been organizing a periodic survey on health care coverage since 2001. The most recent survey (for 2014) found that for the first time since the question was first asked in 2003, there was a reduction in the number of Americans avoiding (because of cost) health care services that they needed. And for the first time since the question was first asked in 2005, the number reporting medical bill or debt problems also fell. Personal financial distress due to medical problems has been reduced, due to greater access to health insurance and due to health insurance plans that now meet minimum standards. Despite this (but not surprisingly given the position they staked out against the reform), the Republican Congress continues to vote to repeal, or at least weaken, the law. The most recent vote was aimed at the provision in the Act which complements the individual mandate to purchase health insurance, with an employer mandate requiring firms with 100 full time equivalent employees or more from January 1 of this year (and with 50 or more from January 1, 2016) to offer health insurance to their full time employees or pay a fee. The proposed Republican bill would change the definition of a full time worker from one who normally works 30 hours or more a week, to one who works 40 hours or more a week. This accusation is confused on several levels. This post will first look at whether there is in fact any evidence that workers are being shifted from full time to part time status as a result of the ACA (or indeed for any other reason). The answer is no, at least at the level of the overall economy. Second, there has been a good deal of confusion in the discussion on what the issue really is with regard to part time workers, including by prominent congressmen such as Paul Ryan. Either Ryan does not understand what the employer mandate is, or if he does, then he has deliberately mischaracterized it. The public discussion has also avoided altogether the real issue. It is not that firms with 50 workers or more would be required to offer health insurance to their employees (most do already), but that this insurance is only made available to their full time workers. Part time workers get nothing, no matter what size firm they work at. The final section of this blog post will discuss a way to resolve this equitably. B. 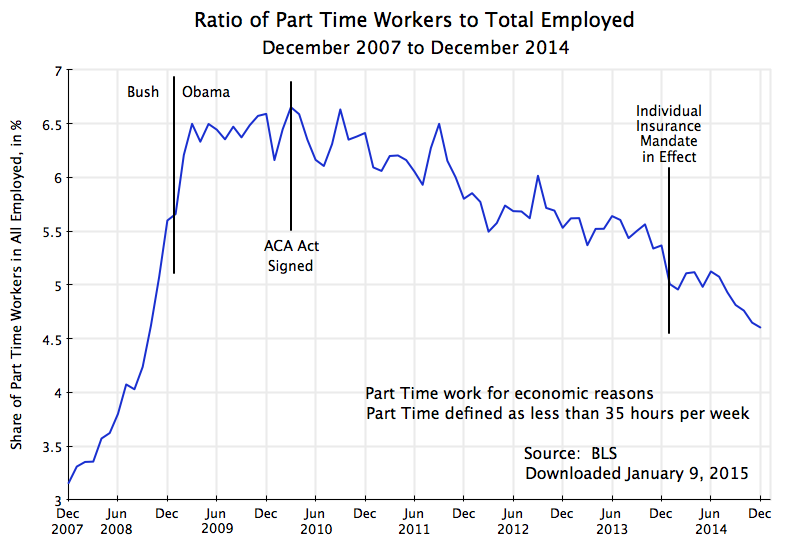 What is the Evidence on Whether the ACA Has Increased the Ranks of Part Time Workers? The opponents of ObamaCare assert that as a result of the employer mandate, firms have been shifting workers from full time to part time status. E.g., instead of employing one worker for 40 hours, they are choosing to employ two workers for 20 hours each. If true, the ratio of part time workers to the total employed will rise. The chart at the top of this post shows this has not been the case. It is based on data from the Bureau of Labor Statistics, from its Current Population Survey. This monthly survey of households is used to determine the unemployment rate among other statistics. The households surveyed are asked whether household members are employed full time or part time (if employed), and if part time, whether this is by choice (because they only want to work part time) or because they want a full time job but cannot find one. The chart above shows the ratio of workers who are working part time not by choice but for economic reasons, to all workers employed. Note that the BLS data defines a part time worker as one with fewer than 35 hours of work per week. While this differs from the 30 hour standard in the ACA, as well as the 40 hour standard in the recently passed Republican legislation, the results in terms of the trends should be similar. The BLS does not publish data with a different cutoff in terms of hours per week for what is considered part time work. As in any economic downturn, the ratio rose rapidly in the economic collapse of the last year of the Bush administration. Regular jobs were disappearing, with some of them shifting to part time status. Indeed, the absolute number of part time jobs was increasing at the time, even as the total number of jobs was falling, thus leading to two reasons for the ratio to rise, and rise rapidly. The ratio reached a peak soon after Obama took office, and began to fall about a year later. Since then it has fallen at a fairly steady pace in terms of the trend. There were sometimes relatively sharp month to month fluctuations in the data, but this can be on account of statistical noise. The data comes from a limited sample of households, with only 5 to 6% or so of those employed on part time status (for economic reasons) for most of this period, so the statistical noise in a relative sense (month to month) will be large. But the downward trend over time is clear, and at a similar downward pace for close to five years now. 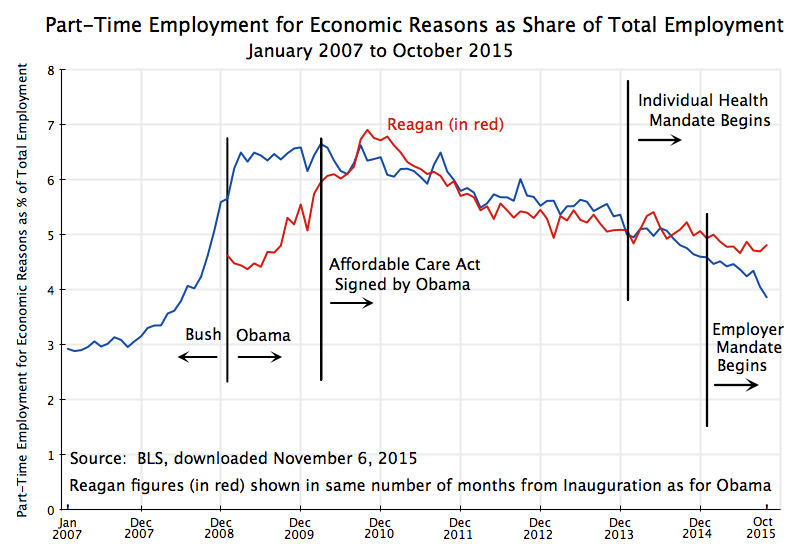 What one does not see is any shift in this downward trend linked either to the signing of the Affordable Care Act in March 2010, or to the start of the individual health insurance mandate in January 2014, or to the anticipation of the start of the employer health insurance mandate in January 2015. Note that since the classification of a worker as a full time or part time worker (and hence the classification of the firm as crossing the 100 or 50 full time worker standard) will be in a period of up to 12 months before the employer mandate goes into effect, one would have seen an impact in 2014 if the 2015 mandate mattered. There is no indication of this. The data cover the overall economy. The figures refer to millions of workers as well as millions of employers. The US is a large place. Within such a large place, it will undoubtedly be possible to find particular cases where employers will say that they reduced worker hours to part time status so that they could avoid the health insurance employer mandate. And one could indeed probably find a long list of firms making such statements. It would be even easier to find a long list of firms and other entities where working hours were cut, whether or not there was any employer mandate pending. In a dynamic economy, there will always be a large number of such cases (along with a large number of cases of firms going in the opposite direction, converting part time jobs to full time jobs). Such anecdotal information, and even a long list of such anecdotes, is not evidence of an issue of substantial scale. As seen above, there is no evidence of it in the overall numbers. But one should still recognize that the issue could exist in particular cases. The question, however, is what is the real issue here, and if there is one, how can it be addressed. Overall, 84.9% of private sector employees are in firms that offer health insurance as part of their wage packages. And 96% of firms with more than just 50 employees offer health insurance. The Affordable Care Act built on this and did not replace it. Liberals (including myself) would have preferred moving to a system where Medicare would be extended to cover the entire population rather than just those over age 65. Medicare is an efficient and well managed program, and as an earlier post in this blog discussed, its administrative expenses come to only 2.1% of the benefits paid. In contrast, administrative costs (including profits) of private health insurance are seven times higher at 14.0% of benefits paid, and an even higher 18.6% of benefits paid in the privately administered Medicare Advantage plans. But Obama agreed instead to support an approach first proposed by the conservative Heritage Foundation, which was then put forward by Republicans in Congress as their alternative to the health reforms proposed by the Clinton administration (coming out of the task force Hillary Clinton chaired), and which was later adopted in Massachusetts when Mitt Romney was governor. These plans were built around keeping the existing employer-based provision of health insurance for most of those employed, but to complement this with markets where individuals could purchase health insurance directly if they did not have employer-based coverage, coupled with an individual mandate to buy such health insurance. The individual mandate is necessary to counter what would otherwise be a resulting death spiral of health insurance plans if everyone is granted access (including those with pre-existing conditions) but only the sick then purchased health insurance (for a description and discussion, see this earlier Econ 101 blog post). It was not unreasonable to believe that the Republicans would not oppose a plan whose origins lies in their own earlier proposals, but that was not to be. As noted, the individual mandate is necessary to avoid death spirals in health insurance plans for individuals. Complementing this, an employer mandate to offer health insurance to their employees is necessary to counter what could otherwise be a “race to the bottom”. If certain firms did not support such health insurance for their employees, thus reducing the cost to them of their workers, they could undercut competitors who did provide good health insurance support. It could lead to a race to the bottom. While not yet widespread in the US, especially for larger firms (see the table above), there has been increasing competitive pressure in the US over the last couple of decades to cut such health insurance support. An increasing number of employers have done so. Thus the ACA includes an employer mandate to complement the individual mandate. However, while the individual mandate went into effect on January 1, 2014, the employer mandate has been twice delayed, and has now (as of January 1, 2015) gone into effect for firms employing 100 of more full time equivalent employees, and will go into effect on January 1, 2016, for firms employing 50 or more full time equivalent employees. It is this provision that the Republicans in Congress are now trying to subvert. However, that is not what the law says. Precisely to avoid such an incentive, the boundaries on the size of a firm subject to the employer mandate is defined in terms of full time equivalent workers (whether 50 or 100). That is, if a job is split from one full time worker to two half time workers, the number of full time equivalent workers is unchanged. The two half time workers count as one full time worker for the purposes of the statute. Cutting back on the number of hours of individual workers to make them part time will not change the status of the firm when the total hours of labor to produce whatever the firm is producing remains unchanged. And it would be foolish for a firm to produce and sell less when the demand exists for such sales, simply to avoid this mandate. There is, however, a critically important issue here which Ryan and his colleagues have not discussed. While splitting jobs of full time workers into multiple part time jobs will not change the status of the firm on whether it is subject to the employer mandate, shifting workers from full time to part time status does affect whether the firm would be required to include health insurance as part of their wage compensation package. Firms subject to the mandate must offer an affordable health insurance plan available to at least 95% of full time (not full time equivalent) workers, or pay a fee. The fee (of up to $2,000 per year per worker, less 30 workers per firm) is designed to partially offset (and only very partially offset) the cost of health insurance that they are shifting to others. But such health insurance typically only is provided to full time workers. This is true even for giant corporations. Hence a firm can avoid making health insurance available to its workers by shifting them from full time to part time status. This has always been the case, and is indeed a problem. The Affordable Care Act addresses the issue only partially and tangentially. By including a definition of what constitutes full time work at 30 hours a week or more, the ACA reduces the incentive to shift workers from the traditional 40 hours per week for full time work, to just under 40 hours in order to avoid providing health insurance cover. A firm would need to cut a normal worker’s hours to below 30 hours per week to avoid providing health insurance, and is unlikely to do that for its regular work force. But by moving the dividing line up to 40 hours per week, as the Republican legislation passed on January 8 would do, one opens up a loophole for firms to reduce worker hours from 40 to say 39 per week (or 39 1/2 or even 39.99 I would suppose). Firms would be able easily to avoid offering health insurance to what are in reality their regular, full time, workers; use this to undercut competitors who do offer such insurance; and thus spark a race to the bottom on health insurance coverage in those industries. As noted above, the ACA does not do much to address the problem of part time workers receiving nothing from their employers for the health insurance everyone needs. Setting the floor at 30 hours per week helps by ensuring workers close to the traditional 40 hour workweek will receive an employer contribution to their health insurance, and avoids the incentive to shift workers from 40 hours per week to just a bit below. But part time workers of less than 30 hours per week will still normally receive nothing from their employer to help cover their health insurance. And it creates an incentive for employers to structure positions as two workers at 20 hours per week, say, than one at 40. While whether or not the firm was subject to the employer mandate would not be affected (since it is expressed in terms of full time equivalent workers), whether or not the firms would need to provide anything in terms of health insurance would be affected. But there is a way to address this, now that the individual health insurance marketplaces are operational under the ACA. All firms could be required to contribute an amount for their part time workers proportional to the hours of such part time work to what full time work would be. That is, if two workers are each working half time, the firm would contribute an amount of 50% (for each) of the cost of the employer contribution to the health insurance for one full time worker. The total cost would be the same whether the firm employed one full time or two half time workers. There would also then not be an incentive to split jobs from full time workers to multiple part time workers. The employer contribution to the part time worker’s health insurance costs would then be paid, along with taxes such as for Social Security or Medicare, to the government in the name of the specific part time worker. These funds would then be used as a partial pay down of the costs of that worker purchasing health insurance on the individual health insurance market exchanges set up under the ACA. And while other splits could be considered, I would recommend that those funds would be split half and half between what the worker would need to pay on the exchange for his or her health plan, and what the government subsidy would provide. A simple numerical example may help clarify this. Using made up numbers, suppose the full monthly cost of a standard (Silver level) health insurance plan on the individual exchange where the worker resides is $400. Assume also that at the current income level of this (part time) worker, the government subsidy for such insurance would be $200 per month, while the worker would pay $200 per month. Now assume that firms would be required to pay proportional shares of what they provide to full time workers for their health insurance, and that this would come to $100 per month for this part time worker. This would be split half and half between what the government subsidy would be and what the worker would pay, so under the new approach the government would provide $150, the worker would pay $150, and the funds coming from the firm would cover $100, summing to the $400 total cost. A few specifics to note: Many part time workers hold down multiple jobs. They would receive for their “account” the total proportional amounts from all of their employers. Many part time workers are also part of married couples. There could be a household account into which all the sums were paid (for each family member), which could be used to purchase a family health plan on the exchanges. In the event that the family was not purchasing insurance through the exchange (perhaps, for example, because the spouse worked at a firm providing family coverage), the amount paid by the firm for the part time worker would be returned to the firm (or canceled from the start). And if the total amounts paid in from the full set of employers for that individual (or family) led to the government subsidy falling all the way to zero, any excess would be allocated to what the individual would pay for the insurance. This could be common in cases where the family income of the part time worker was close to, or above, the income limit on which government subsidies are provided. It is only with the advent of the individual health insurance exchanges that this method for covering part time workers became possible. Previously, firms were not in a position to purchase half of an insurance policy for a half time worker. But now they can contribute an amount equal to half the cost, with this then used to help purchase coverage on the individual marketplace exchanges. Note also that with this reform, it would matter less whether full time work was defined as 30 hours per week or 40 hours per week or whatever. I would recommend keeping the 30 hour per week boundary as it would be a factor in determining what the employer contribution would be. But it would not be as critical as now, where the boundary determines whether 100% of the employer share of the health insurance cost is paid or 0% is paid. There would be a smooth transition (a worker of 39 hours when 40 hours is defined as the standard would still receive 39/40 of the payment, and not zero), without a drop straight to zero. There would also be no reason to limit this extension of the employer mandate only to firms with 50 (or 100) or more full time equivalent workers. All firms should make such a contribution to covering the cost of their workers’ health insurance needs, just as they all make a contribution to Social Security and Medicare taxes. Indeed firms of whatever size (although this will soon apply only to firms with less than 50 full time equivalent workers) that do not have any health insurance plan for their staff should participate. The amounts paid could be set as a proportion to the cost of the medium Silver level plan available on the individual health insurance exchanges in their area. Undoubtedly, there will be assertions by the Republicans that requiring such a contribution to health insurance costs for their part time workers will lead to an end to such jobs. This would be similar to the arguments they have made that raising the minimum wage will lead to higher unemployment of lower paid workers, and arguments that were made earlier that paying Social Security taxes would lead to higher unemployment. But as was discussed in an earlier blog post, there is no evidence that increases in the minimum wage in the magnitudes that have been discussed have led to such higher unemployment. Ensuring firms contribute proportionally to the health insurance costs of their part time workers would not either.